Ultima Thule [officially (486958) 2014 MU69] orbits the Sun at a distance of 43–46 AU, where 1 AU (astronomical unit) is the distance from the Sun to Earth — 1.5×108 km (93,000,000 miles). One orbit around the Sun takes about 298 Earth-years. Its mass is currently unknown, since the densities of the two components depend on their composition, and that could be anything from “fluffy” ice to ice-coated rock or metal. The surface is very dark, almost the appearance of potting soil, and show a ruddy coloration suggestive of organic compounds degraded by eons of exposure to radiation. 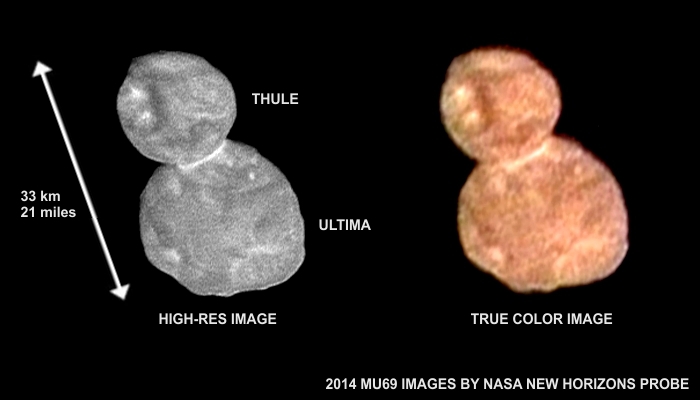 Ultima Thule was discovered by the Hubble Space Telescope (HST) in June 2014. It’s too small, dark, and distant to be imaged from Earth as more than a point of light. But subsequent occultation measurements suggested it was an “oblong” body, or possibly two separate bodies that coalesced. So after the New Horizons spacecraft left Pluto, it was re-targeted to fly by Ultima Thule and take a closer look. The images at top show this enigmatic object in high-resolution grayscale and true color, and confirm it is indeed two coalesced bodies being held together by their mutual gravity, even as they rotate with a period of about 15 hours. In order to coalesce without shattering they must have approached each other with relatively low velocities and only gently “collided”. The animation below shows my take on how this might happen. My animation also shows the origin of the bright ring around the intersection of the two bodies. If there were fresh unweathered ice below the surface layer, it would be splashed out during the collision and produce that bright feature. Further, if the collision were slightly off-axis, the combined body would be rotating slowly as required by the law of conservation of angular momentum. It rotates around the combined center of mass, apparently located below the surface of Ultima. This would be consistent with the idea that the two components are similar in composition and density. Ultima Thule is noteworthy for more than its “snowman” shape, even though that’s what the popular media seems to have latched onto. It is the farthest object to have been visited by a spacecraft, and the second closely-studied example (after Pluto) of a KBO. The data from New Horizons is still coming in so there’s much more to learn. That data will include information about Ultima Thule’s mass, composition, and whether or not it has any small moons. Objects in the Kuiper Belt are largely unchanged from the time the Solar System formed, and hold clues to the origins of the major planets. Mission scientists say it could be until September 2019 before all data is returned. The data transmitter operates at a mere 15 watts of power, allowing a data rate of only 1 kbps. And even at the speed of light, the radio data takes some 6 hours to travel back to Earth. 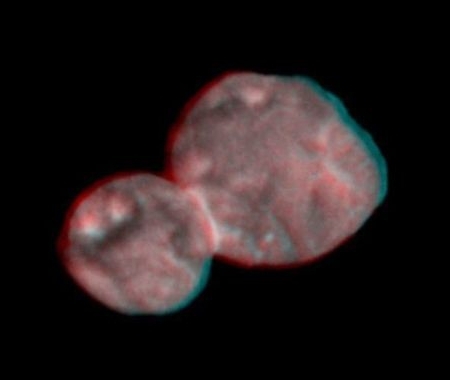 Finally, though I’m not sure what scientific value it holds at this resolution, NASA rendered a 3D image of Ultima Thule. I include it below for your enjoyment. You’ll need one of those red-blue anaglyph eyeglasses to see the effect. If you have the cheaper cardboard glasses, remember: red on the left, blue on the right. It’s not the best anaglyph I’ve seen, but it’s definitely 3D. Look for a followup post later this year after the data from New Horizons is analyzed. If history is our guide, there’s always unanticipated surprises when you go where no probe has gone before.